What a great time. Six O30s came to Loyalist Cove, Bath Ontario in September to compete for the 2014 North American Championship. This was a regatta that featured everything one could want from a regatta – varied conditions, an epic distance race, solid race committee work, wonderful hospitality, very reasonable costs and a nice low key/low stress vibe. The only thing that could possibly have improved the event would have been the presence of a few more boats. Since sailing with Scot Mundle in 2012 at Oswego, I’d been looking forward to lining Attractive Nuisance up against other O30s. At home, most of our racing is beer-can style (non-spinnakered) where we have fun giving the Farr 40s, Melges 32s and Mumm 30s among others a hard time (yes, we’re all in the same division!). So racing against other Olsons was going to be a treat. Sailing with me was a nice mix of young and old. Kyle Assad (Annapolis), my future son-in-law and Billy Hines (Boston) a former college sailing teammate of my daughter’s ran the front of the boat, Jaap Kalverkamp (Greenwich) organized the mast while Roger Pierce (Greenwich) and Johan Koppernaes (Ottawa) of J22 and Snark fame managed the cockpit with Roger also navigating the distance race and Johan additionally responsible for calling the shots. Day One (Friday): The forecast for Friday was for light and shifty northerlies. Sandwiched as we were between the shore and Amherst Island, this created conditions very similar to the ones we get on the Connecticut side of Long Island Sound in a light northerly – lots of shifts and pressure bands. Race One was looking like it was going to start in a big right shift with the boat well favored. On AN we thought we’d set ourselves up for such a start but once it became clear the entire fleet had the same idea, the call was made to slide down the line and just try and get away cleanly. With about 30 seconds, the wind went hard left and we were rewarded with a nice leeward-most start with clear air and going fast. Fortunately, instead of trying to take advantage of our situation by tacking, Johan called for patience and had us to carry on (the first of many great calls). Given the conditions, and the ability to sail our own race, this became a classic rich-get-richer scenario and AN was fortunate to win the inaugural race of the ’14 NAs. Second was Tom Bolland and his team aboard Smoke’Em; third was multiple NA winner Bruce Rand and O’ Naturel. Race Two was a case of forgetting the lesson we’d learned in race one. Again it appeared the boat was heavily favored and this time, we decided to try and exploit that. Unfortunately we got tangled up with a couple of boats and never quite got untangled. Every move from that point seemed out of desperation and only ended up putting us further in a hole. In the end, we finished fifth, with Ben Rotteveed (Investors Group) winning, Bruce Rand showing good consistency in second and Terry Webster (Ritalin) in third. Race Three… Don’t recall the start but midway up the first beat, we thought we were in control with our closest competition, Ritalin and O’ Naturel abeam to leeward. With a large heading puff (30 degrees?) rolling down the course, we looked to be the first boat to tack onto port to take advantage of the new direction. What we didn’t count on was the shift not lasting much more than a nanosecond. The result was we never quite completed our tack and were left floundering while Terry and Bruce extended to the left. From there not much changed with Terry wining and Bruce scoring another second. Race Four is a blur but on AN we regained our race one form winning with Smoke’Em again second and Bruce in third. So after the first day of racing, Attractive Nuisance (1-5-3-1) and O’Naturel (3-2-2-3) where tied with 10 points, with Ritalin (5-3-1-6) in third with 15. Day Two (The Distance Race): A whole chapter could be written about the distance race. 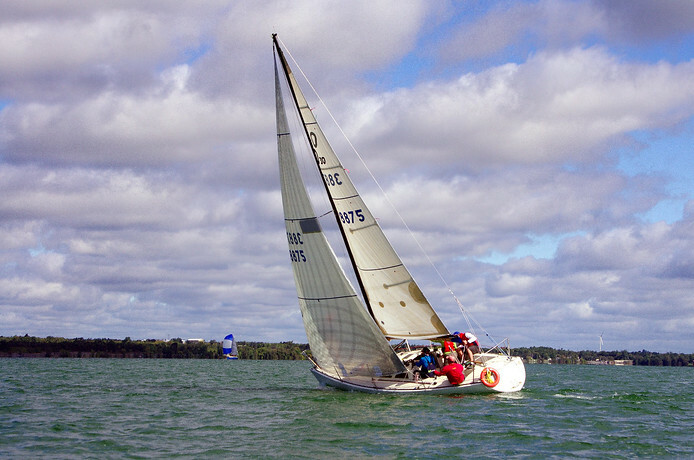 Late Friday, the decision was made to sail our distance race and part of the Amherst Island Charity Pursuit Race. The forecast I was using called for lots of rain, cool temps, but no more than about 18 knots. Winds were expected to veer for south to northwest over the course of the race. The locals weren’t so sure calling for more wind and tellingly, lots of confused seas on the south side of the island. The course was to be counter-clockwise around the island with a bare minimum of marks. The start was a port tack beam reach to the northwest corner of Amherst Island. On AN, we decided the breeze was too far forward and too strong to carry so we went with the H1. Everyone else went with #3s except one boat (Smoke’Em?) that decided to set off the line. Victrix and O’ Naturel took the high road to gain angle for a later set (which they did). This almost worked but when the boats came back together, AN was overlapped just to leeward and bow forward. A “modest” course adjustment to the left made carrying spinnakers a bit uncomfortable for the two boats to windward and AN was able to edge forward where she led up to the turn. The beat to the southwest corner of the island proved very interesting. By all rights, we should have been struggling more than we were. Breeze was 15-16 knots and we still had on our H1. The combination of some nice traveler/mainsheet work and feathering as needed seemed to keep us going through the chop with plenty of power. Meanwhile, the rest of the fleet was bow down and moving very quickly with their #3s but actually making less VMG. Then came the perfect layline call from Roger. We cleared the southwest corner with just enough room to spare while the competition went a bit further offshore resulting in a nice gain. The leg along the south shore of Amherst Island was now a broad reach with the wind veering southwest. The breeze was close to 25 knots with a sea state that was indeed confused something I underappreciated at the time. The decision was made to set as did Victrix. We don’t have instrumentation on our boat so I can’t tell you what speed were making but it was impressive while it lasted. All during this time the wind was continuing to veer. Ultimately, the combination of a lifting puff and a wave picking up our transom put us on the other gybe, with the pole dug deep in the water. Meanwhile, Dave was doing a terrific job keeping it together as they went flying past while we got sorted. With the channel along the east side of the island (and the few actual marks of the course in the whole race coming into play) fast approaching, we focused on navigating and getting ready for the six mile slog upwind. Victrix and Attractive Nuisance reached the northeast corner of the island with Victrix leading by ten boat lengths or so. Both were carrying full mains and #3s in what was now a 25 knot northwesterly. Eventually, AN used her weight advantage to grind down the Victrix team and take the lead. With AN in control of the rest of the O30 fleet, the question arose, could we maintain our lead and win the pursuit race. A heavily modified Olson 40 was coming hard but in the end, AN held on to record the overall win. Sunday’s forecast for the final day of racing was dismal – sun with a mix of clouds but not enough heat to create a thermal and very slack gradient conditions. An early start time was announced in the vain hope that we’d get off a race in the fading morning northerly. Was not to be. The fleet sat and with a 2pm drop-dead time, racing was looking unlikely. Then around 1:30, our PRO must have said, what the hell, they’re here to race. In 2 to 5 knots, Race Six was started. Heavy pin end bias which Smoke’Em won with AN next and O’ Naturel crossing on port behind. An unfortunate luffing match ensued between Smoke’Em and Attractive Nuisance allowing Bruce to leg out to the right. For there, lots of lead changes, lots of movement up and down the fleet as the breeze would glass over only to come in from a different direction at maybe 4 knots favoring half the fleet to the disadvantage of the other. On AN, we were extremely grateful to finish that race second with Bruce taking his first bullet of the regatta. At the end of three days, we’d sailed six races with Attractive Nuisance taking the George Olson Memorial Trophy (1--3-1-1-2 for 8 points) with O’ Naturel showing good consistency in second (2-3-2-3--1 for 11 points) and Ritalin in third (5-3-1--4-3 for 16 points). In all, four different boats won races in what was only a six race series. Again… Terrific fun. With a site now set for the 2015 edition, we hope to be there and hope to see many of our fellow ’14 competitors as well as several additional boats.